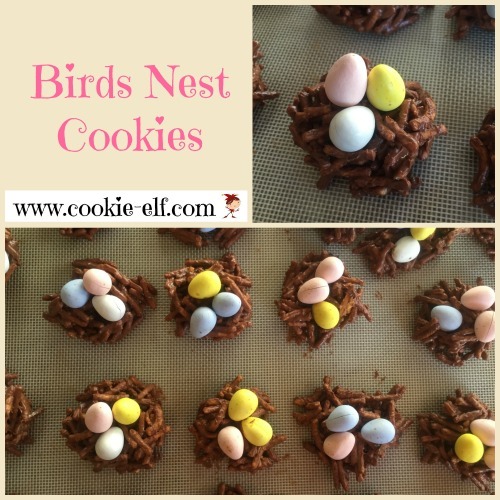 Birds Nest Cookies – they’re an easy and fun no-bake cookie recipe, especially in the spring! Different cooks use different ingredients to make these fun cookies, but the one thing they have in common are egg-shaped candies, pressed into the middle of the cookies after they are formed or dropped. This easy version is a great cookie recipe for kids. Can you say “No oven”? You’ll melt the flavored chips in the microwave and then mix in the chow mein noodles (the birds nest “straw”) by hand. Kids love to drop the nests onto baking trays and press the eggs into the centers before they set. Line baking sheets with waxed paper, parchment paper, or silicone baking mats. Place butterscotch morsels and chocolate chips in a 3-quart casserole or other large microwave-safe dish. Heat on full power in the microwave for 1 ½ - 2 minutes, stirring every 30 seconds, until mixture is melted, blended, and smooth. Remove bowl from the microwave. Add the chow mein noodles and stir them into the chocolate mixture until the noodles are thoroughly coated. Use a soup spoon or tablespoon to scoop mixture from bowl onto prepared baking sheets. (See more tips for how to scoop sticky cookie dough onto baking sheets.) Press a small well into the center of each cookie and fill it with 3 egg-shaped candies. Allow cookies to chill in the refrigerator until set for 30 minutes. Remove cookies from baking sheets and store them in an airtight container in the refrigerator, placing waxed paper in between layers. You can use proportions of butterscotch and chocolate chips to your taste as long as chips total 2 cups. For instance, if you prefer a caramel flavor you can combine 1 ½ cups butterscotch morsels with ½ cup chocolate chips. Birds nests will stick together better when you melt an additional ¼ cup of chips (any flavor) into the mixture. You can reduce the number of candies when you place just one or two candies on each nest. Save money when you buy egg-shaped candies on sale after Easter to use in this recipe later in the spring. See more no-bake cookies on our Pinterest board.